Our local gaming group recently made a big order for 6mm modern stuff since we are starting to play Cold War Commander.I decided it will be good idea to write some reviews of the miniatures we received. 2S9 Nona (Anemone)- 120mm SPH/Mortar is a perfect choice for Russian airborne troops, providing you with some long distance fire support. It comes in two parts (turret and the rest) at 40 pence a piece. It’s good that you can just buy single vehicles from Heroics and Ros, as you don’t always need five of each (as sold by Skytrex and GHQ for example). Model itself is decently made, all six I ordered didn’ty have any parts miscast, barrels look sturdy enough not to break immadietely when bent. Not amazing amount of detail, but then comparing it with highly detailed GHQ equivalent its more than 3 times cheaper. If you are not obsessed with highest quality possible it will be an excellent choice for your army. Pack costs 2.5 pounds. Not a lot and with the good quality, it is in my opinion best supplier of 6mm modern infantry in the UK. Litthe bag contanis 48-50 figures. Apart from regular airborne infantry in few different poses (including soldier with radio) you get two 120mm mortars with crew, two HMGs with crew, two snipers, two SA7s, couple of commander models (with field glasses), two recoiless rifles, 3 Spigot ATGW teams and few RPGs. Not bad for 2.5 pounds I would say! I hope H&R will release Soviet airborne in action- type of pack (just as the one for normal Soviet infantry that they sell) to add bit of dynamism as figures in that pack all mostly marching/prone. 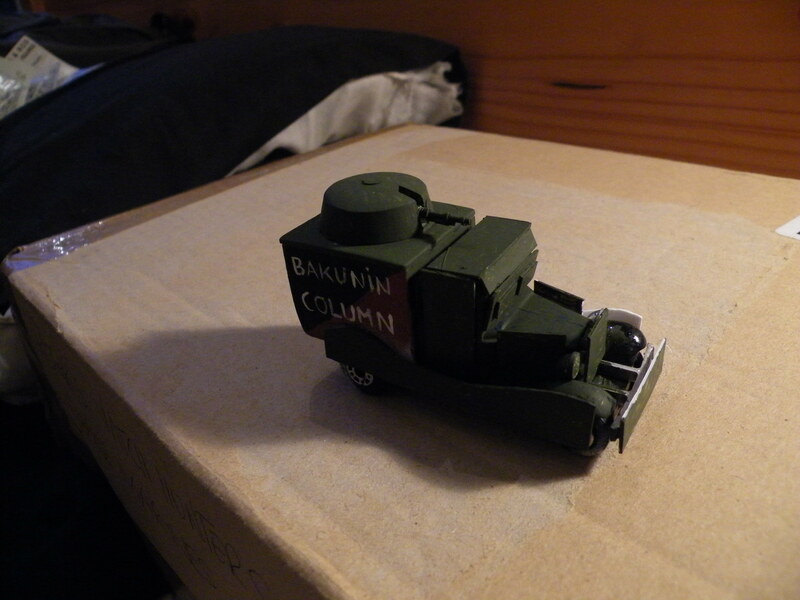 I scratchbuilt this imrpvised armoured car for my Anarchist force for Very British Civil War. It just needs to have its painting finished, but so far it looks good to me. What do you think? So the project is almost finished. Some time ago I found out that my mate is not going to make it to Warhammer 40k doubles tournament that we were going to attend. Since the organiser of the event allowed me to play on my own, I needed third battlewagon for my orks. I have two of GW ones and didn’t want another one looking exactly the same so decided to build my own , proper ork “kustom job”. It is 11 inch long with deffrolla, proper monstrosity (and accidentaly was always getting blown to bits as first in the tournament, even though it has exactly same stats like other wagons 🙂 ) and I am very proud of it. It only needs finishing touches now (maybe bit more mud effect on wheels, finish painting grot rigger on the turret, maybe few decals and attaching deffrolla properly to the front.